· Historians who have studied the Great Depression feel the terms that Germany had to agree to in the Treaty of Versailles were the cause of their catastrophic downfall when the Great Depression came about. · The Treaty of Versailles was not the only devastating factor that contributed to the economic collapse in Germany. · The other factor in Germany’s demise was an international trade war which had been sparked and started by the passing of the Smoot-Hawley Tariff Act in the United States in 1930. · Many German industries were effectively prevented from selling their goods to foreign markets. · Germany tried desperately to pay off its reparation fees. 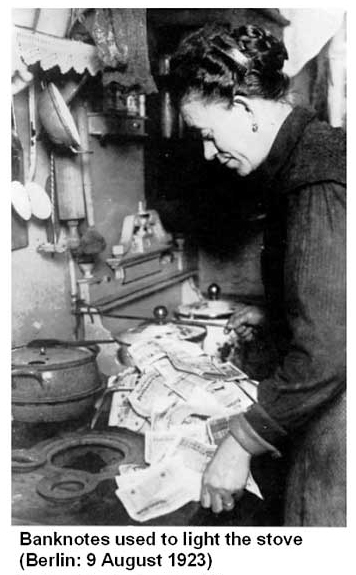 Germany even took part in a gigantic hyperinflation of its currency which consisted of printing paper marks. Until the year 1923, they were worthless pieces of nothing. · With the evaporation of the currency in Germany, people’s savings were wiped out. · This meant that there would be almost no capital available within the German economy for years to come. 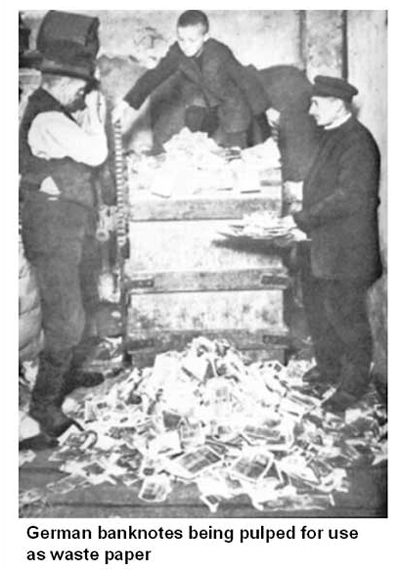 · Out of all the World War I combatant nations, Germany was the one and only to destroy its currency. · This alone could have started a depression in Germany. Adding this factor to the others, you can clearly see why Germany was hit so hard by the Great Depression.